Korea is filled with charming Korean Pop Stars and Korean Drama Actors and Actresses, and they have a lot of fans, I mean a lot. Maybe you yourself are a true fan of a Korean celebrity and will support this Korean celebrity till the very end, even if no one else will support them. 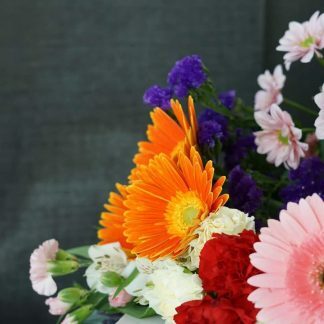 If so, then you will understand why so many people have decided to place orders with Flower Gift Korea to send flowers and gifts to Korean celebrities in Seoul, South Korea. And you may want to send a gift to your favorite Korean celebrity who is living in Korea, but you may not know how. Well, you’ve come to the right place. Keep reading and you’ll find out exactly how you can send flowers and gifts to your favorite artist, idol, or celebrity in Korea. Let’s take a look at a few questions. 1. Is it even Possible to Send a Gift to My Favorite Celebrity in Korea? First, let’s talk about whether or not it is even possible to get your gift to your favorite Korean celebrity living in Seoul South Korea. You might be in love with a famous celebrity in Korea, which is awesome, and you might really really want to send them something to show your support. But it’s really difficult to send gifts to certain celebrities because there really is no way, unless you know them personally, or their manager, or a fan club owner who has permission to send gifts to them. or the agency allows it for a special occasion. For most celebrities, it is best to send gifts to their agency because most agencies gladly accept gifts for their artists and actors, but not all do. We actually had the chance of sending member of Big Bang G-Dragon some flowers by visiting his home, but security at his home no longer accepts anything for him there. And YG Entertainment does not accept gifts at their front door for any of their artists or workers unless the manager or the artist knows the person sending the gifts. So sending gifts to G-dragon is out of question, but we were able to send gifts to Seungri. Even though he is a member of YG Entertainment with the same group G-Dragon is, we were able to send some flowers to him for a fan. Do you want to know how? In the above image, you can see our Lily Rose bouquet in front of the store, “Aori Ramen”. If you are a true fan of Seungri from Big Bang, you would have known that he owns this Ramen franchise and this is the restaurant location in the Konkuk University area, which is in Seoul South Korea. 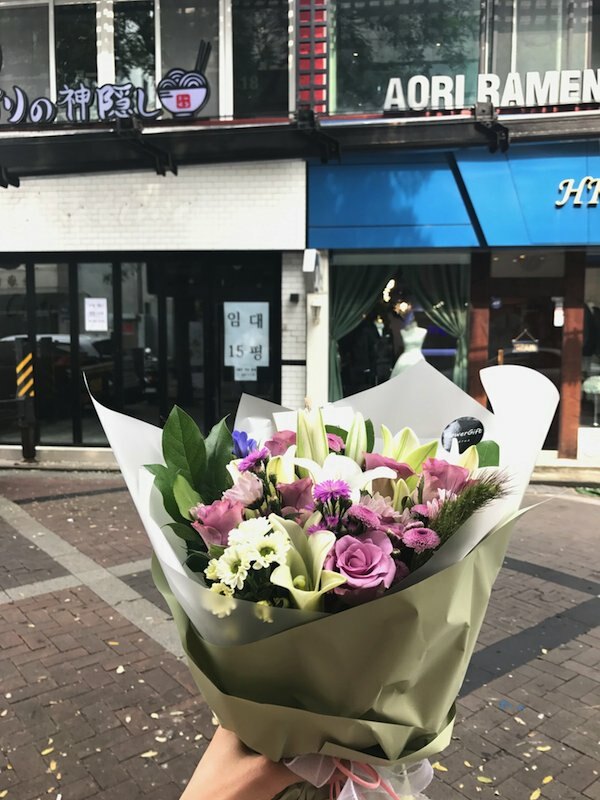 Fans sent him this bouquet as a “Congratulations” gift for the opening of his 9th location in Seoul, South Korea. So if you didn’t know, Seungri is not only a successful singer, he is also a pretty successful businessman. The good news is that, almost all of the other agencies that we contacted so far said that it would be okay for Flower Gift Korea to deliver flowers or gifts to their building. So, as long as you aren’t trying to send gifts to YG Entertainment, SM Entertainment, JYP Entertainment, and now Big Hit Entertainment, you have a good chance of getting your flowers or gifts to your favorite Korean Pop Celebrity in Korea. It is not to say that they never allow for gifts, but only allow for gift delivery on certain days and you need the delivery person to show proof. For example, for BTS,. A fan told me that you can fill out an application form on their website about sending a gift. Once they approve your application, they will tell you how to deliver the gifts. It wasn’t always like this for Big Hit Entertainment, but BTS is super famous now and no longer accepts gifts without giving approval. If for whatever reason the agency does not accept gifts for celebrities, there are still some things you can do to get your gift to your favorite Korean celebrity living in Seoul. 1. Send the flowers and gifts to the theater where your favorite Korean Pop Star is performing in. They accept gifts for celebrities at the front desk or information booth. However, you have to make sure to get the gifts to the theater on the day of the performance before the show ends. So it is very important to understand that cheaters and concerts are different. Some concerts do not accept gifts for the celebrities, while some do, so you’ll have to find out from other fans, but every theater has accepted gifts for people acting in the performance, even artists who are with SM Entertainment, JYP Entertainment, and YG Entertainment. 2. Become really good friends with the owner of an online fan club and ask them for a favor. We have actually been requested to deliver flowers and gifts to fan club owners who would then deliver the gifts to the famous Korean celebrity. 3. Send the gifts to the artist’s coffee shop or business location. Just as we delivered a bouquet to Seungri’s restaurant, we have also delivered gifts to cereal store of Jo Kwon from 2AM for his birthday. Most of the artists’ business places accept the gifts, even the restaurant of the artists’ mother has accepted gifts, but not all do. Some artists are really specific about not accepting gifts from fans and have their employees reject them at their cafes and restaurants. So make sure to ask fellow fans for as much information as possible. 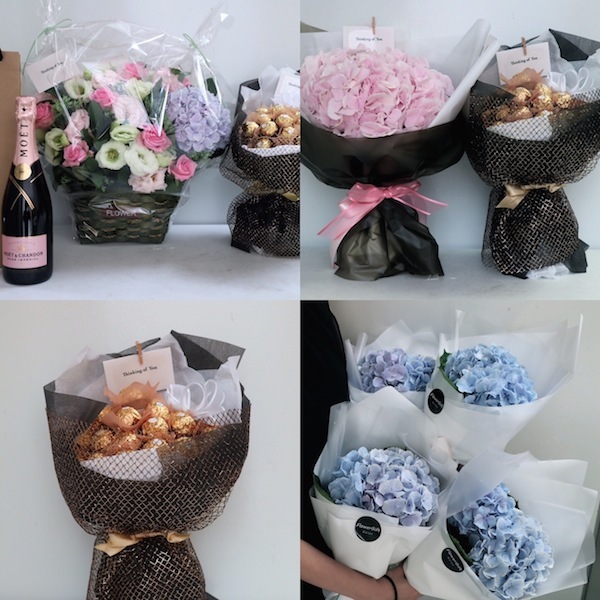 We at Flower Gift Korea have a lot of experience delivering to celebrities and artists in Korea, but we do not know everything. But we will do our best to help. 2. What Should I Send? A) Chances are that your favorite celebrity is on a busy schedule and is not likely to visit the agency building every day. B) There is a chance that your favorite Korean celebrity won’t even be in Korea. C) You need to be aware of how long it takes to make the flowers or gifts and how long it will take for the delivery to be made. Since Korean celebrities may not be at the agency everyday, it is a bad idea to send fruit or any kind of food that expires quickly. Flower Gift Korea has snack boxes that are filled with snacks that last for many months, which are good gifts to send. Even flowers can last a few weeks, but a big no no is fruit and even cakes! I personally made a delivery and I saw something terrifying! It was a cake that was sent for a Korean celebrity’s birthday, which was left in the pile of gifts. And the cake was definitely not going to be eaten by the Korean Pop celebrity. Just look at the video below and you will see why. There are some agencies where it is okay to send a cake to because some agencies have a front desk that can at least take care of the gifts. But there are also some agencies that have a drop off place for gifts that no one is really looking after. Also, there are some online shops you can’t trust. The video above was footage of a cake I took while dropping off one of our snack boxes for a celebrity in Seoul Korea. I was so disgusted when I saw the cake with at least 20 small flies in it. I felt really bad for the fans who had trusted the online gift company with their money and reputation. What do you think the celebrity will think of the fan once he/she sees the cake? That’s why you need to be very careful with what you send to your famous Korea celebrities in Korea and who you can trust. We have actually delivered a few cakes. 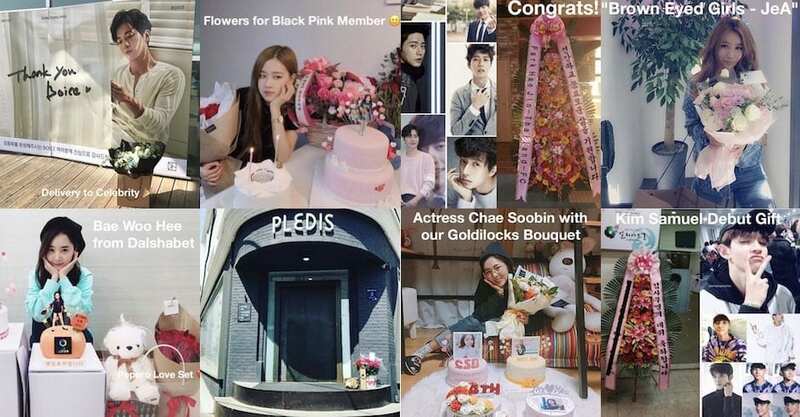 Though we don’t recommend sending a cake to a celebrity that doesn’t know you, Flower Gift Korea at least makes sure to do what we can to get the gifts and flowers to somewhere safe. You can see our flower and a bag of gifts left for CN Blue’s manager in front of the front desk of FNC Entertainment. There is a cake in there too. At least it is inside the building, so that people there could take care of it. If you look at the image above, you can see that all the gifts are in the building. That means it will be safe and looked after. I know that you may want to make your favorite Korean Pop Celebrity feel special on his or her birthday by sending them a cake. You may imagine them eating it happily and being thankful of you, but they most likely won’t see the cake for a few days. At the very least, you should send something that lasts at least a few days. A cake will go bad within a day or two if it doesn’t go into a refrigerator, which won’t happen if someone working for the agency is informed about the delivery. Since you want something that lasts a few days, even at least a few weeks, you should only really send flowers, teddy bears, or some snacks. Flowers and gifts all sent to members of Infinite. The above image is a good example of what is okay to send to a celebrity. These gifts were delivered to the theater where one of the members was performing in a musical. We delivered flowers for an actress who is in Moon Lovers: Scarlet Heart Ryeo to this agency’s office. Also, it is possible to send gifts if you get them delivered to the agency. But, remember, not all agencies accept them. So if you are a little suspicious about the online store that says, “no problem, just give me your money and everything will be okay”, you should be. It is best to call the agency and ask. If you are unable, a good rule is to figure out how big the agency is. The smaller the agency is, the more likely they will accept gifts at their location. 3. Where Can I Send the Gifts to? There are a few places you can send the gifts for celebrities to receive them. One of the best places to send to is the agency the Korean celebrity is a part of. If you don’t know what the address of the agency is, check out the website kpop.fandom.com or simply search for the agency on Google. Another place you can send the gift to is a musical theather that the Kpop celebrity is acting in. You need to find out where the musical is being played and the delivery can be made anytime before and during the show time, but make sure you know which day the Korean celebrity is performing because they may not be performing at every show. Another thing you can do is send the gift to a fan club owner that you trust. Then that fan club owner can deliver it to the celebrity for you, but not all fan club owners may do this for you. And one more place is the celebrity’s actual business. Some celebrities own a coffee shop or have parents that own a coffee shop or a restaurant that will accept gifts for the celebrity. So here is when we made a delivery to Super Junior member Yesung. For his birthday, fans sent him one of our flower basket designs, which is the sunflower basket right in the middle of one of the images! He is under SM Entertainment, which does not allow some of their members to accept gifts at their agency, but Yesung instagram posted a thank you for the gifts he received at his coffee shop, “Mouse Rabbit Coffee.” So you can send gifts to the business the artist owns. Flower Gift Korea has a lot of experience delivering gifts to celebrities in Korea. Sometimes we actually give it directly to the Korean celebrity. So if you need to send a gift to your favorite celebrity to show how much you are supporting them, we are the best choice. You can see a list of some of celebrities we have delivered gifts to. -We have never been rejected at agencies that are for actors/actresses. -If you are unsure of what to write when you order on Flower Gift Korea, just write as much as you can and we will contact you if we need to. We can find the agency information by searching the internet in Korean. -The artists and celebrities are very very busy, so if you write pages and pages in your message to them, they will most likely not read it. Hey, do you know how to send a gift to YG Artist? by address of yg building in google maps? Hello, it really depends on the artist. You need to find out by either asking people at a fan club site of the actual artist’s website. Some artists do not accept gifts from fans. For example, G-Dragon only accepts gifts if the manager allows for it. However, members of Blank Pink accept gifts at a particular address. So it really depends on the artist. If the particular artist at YG does not accept gifts, your gift will be rejected by the front desk of YG Entertainment and your gift won’t reach the artist. Is there any chance that if we send a gift they can accept it? I honestly have no idea. If they are under YG Entertainment, then you would have to figure out if a member owned a cafe or a restaurant and try to send it there. But I am unsure if they will accept the gift. Some celebrities also reject gifts when delivered to their cafes, though most accept them. Maybe it is best to ask other fans. However, I do remember that we delivered to Um Ji Won before to J Tune Camp agency, or something like that. And they accepted it for him there I believe. I read at sechskies homepage in YG website that they are currently accept gift for sechskies member. But we have to submit an application first thouugh. Once our application is accepted, we can send the gift. My question is if my application is accepted, all i have to do is order the flower bouquet from this website and it can be delivered to them, isn’t it? Do you accept order from overseas? Pretty much. But yes, we accept orders from all over the world. We have received orders from 80+ countries already. You can pay on our website with PayPal or any major credit card. Regarding ordering and sending gifts to YG members, you need to make sure that you find out the day and time range they are allowing gifts for a certain artist. And once you get approved, we need you to email us a copy of the confirmation email so that we can show the front security guard that you have been approved. Please email the approval email to flowergiftkr@gmail.com and provide us with whatever information YG provides for you. YG is pretty strict with accepting gifts. How do I send a gift to blackpink? Hello, Black Pink only accepts gifts on certain days, at certain times, and at certain locations. We do not know when, but other fans should know or fan pages. So you need to ask other fans for more info. Then once you get approval from the agency, you need to email us the proof of being accepted to send gifts. Then we can make a delivery for you if you order flowers and other items off our website. Hi . I’m from MALAYSIA . How can i send gift to kim heechul from SM ENT ? Hello, unfortunately, SM Entertainment does not accept gifts for their artists at their agency. And we do not know how to deliver to Kim Heechul. It is probably best to ask other fans how they did it. If he owns a business somewhere, then they may accept the gift for him there. How to order? And is it needed to provide the address? What if i only knew the artist name and not the exact place? Hi, you need to tell us the name of the artist and the agency. Then we can find out where the agency is and see if we can deliver to the celebrity. If the artist is with YG Entertainment, SM Entertainment, JYP Entertainment, or any of the really big agencies, you need to actually have permission from a fan club, the managers, or the artists themselves. They will not take gifts at the front at some big agencies. If it is a small agency, it will be easy for us to deliver your gift. You can place your order by finding the product you want on our website, then you choose location (Seoul) since most agencies are in Seoul, then click “add to cart”, once you choose all your items, you can “checkout” and make your purchase. Then Flower Gift Korea will prepare and deliver the gifts. Hello, we have sent some gifts to Brave Entertainment for Kim Samuel. I think it is best to send to his agency. We have even sent to Pledis for Nu’est Aron recently, even though Produce 101 is still happening. They are employees of the agency, so they still have to visit their agencies time to time. And the people at the agency will most likely let him know the gifts have arrived. Hello! Do you think IT Entertainment will accept gifts? They are a rather small company. Thank you! Hi Joy, I am sure IT Entertainment will gladly accept gifts. Even MYM Entertainment accepts gifts for Lee Min Ho. The only one I know that doesn’t accept gifts without a manager or a fan clubs owner connection is YG Entertainment. I have a feeling JYP Entertainment and SM Entertainment may not accept gifts at the front door either, but we haven’t tried yet. Do you know anything about TS entertainment? How to send a gift to Yoo Jae Suk? Where do I address to? how to send gift to Yoo Jae Suk? hi! you mentioned that blackpink accept gift at a particular address? wahh~ do you know the address and how can i send them? Hi, actually, the address was of a fan club owner. So though they accepted the Gift at that address, you will need to get in contact with the fan club owner. She was already expecting our delivery, which is why she accepted the gifts. Unfortunately, I do not have the owners contact. Hello, your post was very informative. I now know how to send a gift to MC Yoo. I do have one question. I want to send a gift to BTS do you know if the headquarters address on google will accept my gift? Hi, is it possible if I want to send my gift to Kim Samuel by myself? or probably through his agency. do I need to contact Brave Ent. first or is it okay if I go to Brave Ent. and leave my gift there? Hello, it is possible I believe. I think it is best to deliver it to his agency, but sometimes there is no one there. Then you need to figure out how to leave it for them. Usually there will be a phone number on the front door for delivery people to call. When we made our deliveries to Brave Entertainment, we just went there, but we went as people just delivering items. If you go as a fan, I’m not sure what the outcome will be. The times we went, no one answered the door and we ended up calling the number on the door. And I’m pretty sure it was actually Brave Brother himself who answered, and he instructed me to leave the gifts with a nearby security guard. If you do go by yourself and no one answers the front door, then you’ll have to speak in Korean and figure out where to leave the gifts. I was just going to leave the gifts in front of the main door, but the man on the phone asked me not to do that and instructed me to leave the gifts with a security guard of a different building nearby. Hello, I’m from Vietnam. I would like to send gift to Ong Seongwoo from Fantagio. Do we need to have permission from the company?? hye. im jie from malaysia fans of kim yong guk in produce 101 season 2 from chun entertainment. i really want to send him a gift. i think he become trainees back at his company after getting eliminated from the show last week. i already bought him a jacket here in malaysia but i didnt know how to send it using international courier as i dont know the exact address. it is possible for you to send him the gift on behalf of me ? Hello, we can deliver it on your behalf if you purchase $100 US or more from our shop. Then you will have to send it to our shop in Seoul and we will combine the jacket with the gifts you purchase from our shop and deliver them all together. You will also be responsible for paying for the delivery of the jacket and whatever taxes are necessary. If you are interested in doing this, please email us at flowergiftkr@gmail.com and we will give you more information. Hello:) I’m Nisa from Indonesia and I’d like to send a gift for Kim Samuel from Brave Ent. But I don’t know how. And I could’nt give it to his agency all by myself. I mean, right now I don’t have any plan to go to Korea:( Could you help me with that? Or tell me how to send a gift for him? Hi, thank you for your comment. We can send any of the gifts we have available on our online shop to Brave Entertainment for Kim Samuel. Also, if you spend $100 US on our website, we can combine some gifts that you send to our store and deliver them all together for you. Or you can try to deliver it to Brave Entertainment yourself. I’m not sure if they accept gifts from fans at their office, but they might. And if you are sending gifts from outside of Korea to Brave Entertainment, I am not sure about that, since we have no experience with that. Hi, I believe it would be best to send to Pledis Entertainment, since only Minhyun will be with YMC Entertainment, and the other NU’EST members will know what to do with the gifts. Also, you don’t have to order $100 to get it delivered. You can even spend just $25 US and send a stuffed toy from our shop to Pledis Entertainment. Our delivery costs to Seoul are $13 for flowers/plants and $5 for other items or add on items. If you want us to take a photo of your gifts outside of the agency, you will have to order at least one flower though. You can email us at flowergiftkr@gmail.com if you have any questions. Hi, I’m from Vietnam and I want to send gifts to Monsta X :3 Would it be possible to send to Startship ent? And can I send it through EMS? Hi Sophia, I think it might be possible. 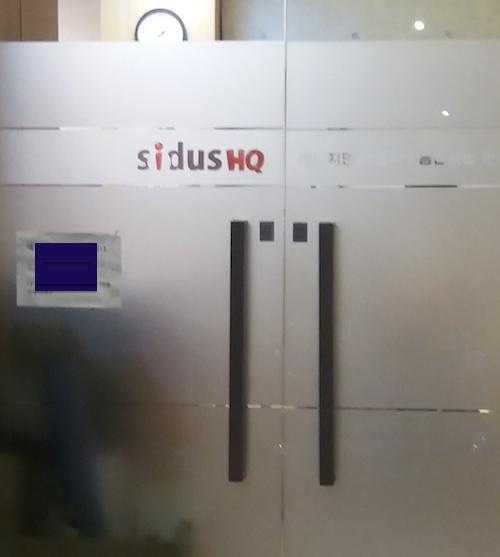 We have delivered to Starship Entertainment before, but it was a delivery man from our team. I think your package will get to Starship Entertainment’s building, but I am not 100% sure who will receive it since we have not used EMS to send anything to this agency. And also, you are sending from outside of Korea. We have received many packages from outside of Korea and combined them with flowers for delivery. But if you are going to send directly to Starship Entertainment, I don’t really know because we have never used EMS to send to Starship Entertainment before. So I just read the other answers you gave…SO I should just use Pledis adress? Which I can find on the internet ? Hello, you can go to http://kpopvisit.com/kpop-directory/478/pledis-entertainment/ to see some info about Pledis Entertainment. There you can find the address. Sorry to bug you here to ask which address to post a letter envelop for actor lee jong suk who is with yg entertainment? will this be accepted & delivered to actor or not? Hi, not a problem, you can look for YG Entertainment’s address on the website http://www.kpopvisit.com There are a list of agencies on that page with their information like address, phone number, etc. I am not sure of letters, but when we delivered flowers there and other gifts, the man at the front told us that they don’t leave anything at the front, unless a manager or the artist knows that it’s coming, or if they know the person. So if you mail a letter, maybe it might get left somewhere for the actor, not sure. ji Hyun under soop management? I read your comment about how you were able to send your gift to Blackpink because you were able to get in touch with the fan club owner. Could you tell me what the fan club name was? Was it the owner of the fancafe for Blackpink on daum.net? Please tell whatever you can remember. I would like to send a gift to them in the way you did. Also, do you think YG Entertainment will accept gifts directly at the building if it is one of their artist’s birthdays? I see pictures of idols with many presents on their birthdays, so the agency must not be as strict on their birthdays right? Thank you so much! Hi, unfortunately, I was given a message from a Black Pink fan and I was able to show that message to the man at the front door. He then called someone to pick up the flowers. The person came from a different building in the area and picked up the flowers. Unfortunately, I no longer have that message. It was in Korean, so it’s a fan club owner who is Korean, who lives in KOrea. That’s all I know. So it was the fan who got in touch with the fan club owner. The fan club owner was already expecting the delivery. Also, what I know is that YG Entertainment only accept gifts at the front door if the person who is receiving it comes and gets it. So the artists already know that a particular gift is arriving on a certain day and their manager or they themselves have to let the front desk know about the gifts. I’ve been turn down before at the front desk, so I wouldn’t risk sending something to YG Entertainment. Hello, unfortunately we haven’t tried yet. I am unsure if they will accept our gifts. We tried contacting them before, but no one answers the phone. So I’m unsure if they accept gifts or not, but if I were to take a guess, I think they wouldn’t take any gifts from fans at their building. But I could be wrong. I’m nemo from Sweden and I wanna ask if I want to send a gift from Sweden to cnblue, what should I do ? Hi, you have two options. 1) You can choose some of the flowers or gifts we have available on our online store at https://flowergiftkorea.com/shop/ and find the address for FNC Entertainment (CNBlue’s agency) at http://kpopvisit.com 2) Just find the address for FNC Entertainment (CNBlue’s agency) at http://kpopvisit.com and send them your package from Sweden. hello , so i want to send something to bts and i don’t know how how can i contact you to help me! thank you in advance! Hello~^^ I’m FuisaChan from Malaysia. I want to send a gift to Jae Day6 for his upcoming birthday. Do you think it is possible for me to post it by myself and they accept it or might be a flower delivery from your shop maybe? Hi 🙂 You can send a package to his agency address and it should arrive there, but there is just no way of knowing for sure if it arrives on the correct day or even at all. If you order a flower with us, we can make sure of the delivery day and even match a time range. Please let us know if you have any other questions. Hello! I hope you are well. If you are just sending a letter, than you probably have a better chance of just mailing it to their agency. If you go to their front door with just a letter, I think the staff may be a little annoyed if you ring their front bell for that, but who knows, maybe they won’t. Usually, we just go and deliver our gifts as delivery people and not as fans. So if you go to their front door, most likely a staff of Pledis will answer the speaker and ask “who is it?” in Korean. Then what will you say? If you say you are a fan, they may just ignore you to be honest, because they get fans trying to see their artists all the time. But they always receive packages and gifts from Korean delivery people. Hello, I live in the USA and I am looking into sending SeolA from WJSN a package of gifts and a letter for her birthday and Christmas, as she was born on Christmas Eve. She is with Starship Ent. I talked to 2 Korean SeolA fansites that said that she would surely receive the gift if I sent it to Starship around her birthday time. But I want to be certain since the gifts I am choosing are a bit expensive. Could you help me at all? Do you know if Starship really does accept gifts, and if they do, what is the best way to make sure she gets it? Thanks! The only way you can make sure is if you first mail the gifts to us and then we combine them with an order you place with us. We would take a picture of all of the gifts together at our shop and would try to take some photos at their agency. However, their agency does not have a big sign outside that says, Startship Entertainment and if there are staff members outside at the time of delivery, we may not be able to get a photo at the agency. For this to happen though, you would have to spend at least $100 US on our shop on flowers and other gifts which we would combine with your other gifts. But the items cannot be too big. If the items are too big, then you’ll have to just send it directly to their agency through a delivery service. But the only way to make sure they get there is to have someone you trust bring it to their agency, and Flower Gift Korea has a lot of experience delivering to celebrities in Korea. We have delivered to Starship Entertainment before. You can email us at flowergiftkr@gmail.com if you are interested. Hi, we have sent many gifts to Pledis Entertainment to their artists. You can send anything we have available on our website at https://flowergiftkorea.com If you have any questions, please let us know. Hi, we are planning to send gifts to Daniel and Ong via shipping, we are wondering if you can help us on the process and the needed requirements if there are? Please eamil me back. Thank you! Hello, I know that they receive packages and deliveries there for their artists. If a fan goes and says they have a gift for someone there, will they accept it from the fan? I don’t know about that, as I have no experience with that. But you can send gifts through us and we can deliver them for you. We have already delivered to BEAST from cube Entertainment. Hey, I was wondering if you guys could send some gifts to Taehyung from BTS (big hit ent) for his bday?? Hello, we have delivered to Big Hit Entertainment before, so it shouldn’t be a problem to make a delivery to them. Unless they have changed a policy, but I haven’t heard anything about that. You can choose items on our website https://flowergiftkorea.com and you can find the address to Big Hit Entertainment on http://www.kpopvisit.com Also, you can email us at flowergiftkr@gmail.com if you have more questions. hello. I’m from the Philippines , I was wondering if you guys could send some gifts to Kim jong kook ( running man ) and Jackson Wang (Got7) ? Hello, we can send gifts to King Jong Kook’s agency for him, which is Maroo Entertainment. But the last time we checked, JYP did not accept gifts for their artists at their agency. I am not sure if this has changed. You will have to email them at fan@jype.com and see what their answer is. My guess is that they still don’t accept gifts for their artists at the agency though. But you never know. how about mode of payments ?? Hi do you know if i can drop a gift to FNC entertainment by myself? Because i’m going to seoul for a trip so I’m considering dropping something for one SF9 member. Can he receive it if i drop it at the front gate? Hi, I am not 100% sure. 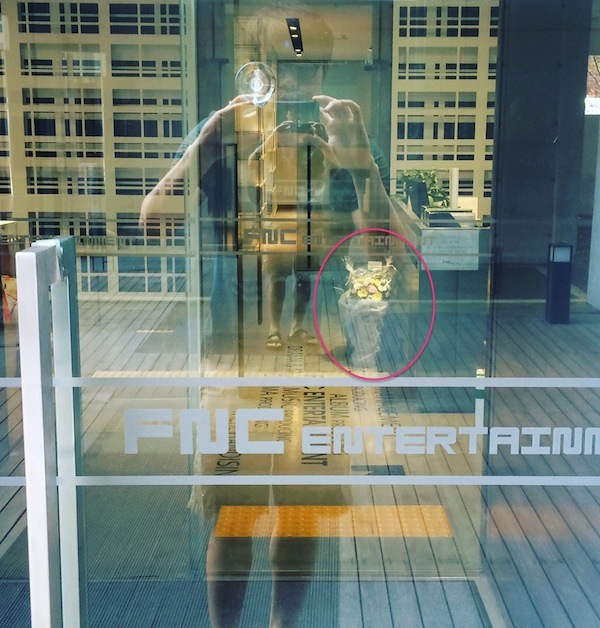 We have delivered to some artists at FNC entertainment by leaving it with the person at the front of the agency. But we have not delivered anything recently. The last time we went was more than a few months ago, so I’m not entirely sure about their policy now. But the front door man usually cannot speak English, so you’ll have to figure something out. Can I send flowers or something in SM Ent since Minhos bday is coming up? I’m a little afraid cause I heard something about SM not accepting any gifts?? Hello, from what I know, SM does not accept gifts without giving approval through their fan group or fan membership thing. One way you may be able to send gifts to artists of SM is if you send it to their parent’s business or their business. A lot of artists own their own businesses, like restaurants and cafes. and also Seungri? Can I send one and delivered the gift to Seungris Shop? the Aori Ramen? Hi, we delivered to one of Seungri’s Aori Ramen locations before, but I remember that the workers there were expecting it. If you order something from us, we can definitely deliver it to any of Seungri’s business locations, but I can’t promise you that they will accept it. Most businesses accept the gifts for the owners though, but it is something you should try to find out from other fans or from fan club sites. If your gifts are rejected, then we aren’t able to provide a refund, so it is best to find out first. How about the Around US Ent? For Highlight Members? We have’t delivered anything to Around US Entertainment yet, but since they are quite new and not as big as other Kpop groups, there is a very good chance that they will happily accept your gifts. However, it is best to check by sending them a message or email. Hi! I’m Jayne. Do you think it possible to Maroo Ent. to accept a gift? I want to give to BONUSbaby! Their first anniversary is coming!! Thank You~ Have a nice day. Hello, Maroo Entertainment is a very small agency, so it is very likely that they will accept deliveries at their agency for their artists. Hi! Do you have any information, is it possible to send gift to G-Dragon? Are they (the staffs, managers, or management) usually accept it or not? I am wondering if you could help me delivering gift from your shop, along with my letter. What do you suggest? Thank you! Hello, it is near impossible to send G-Dragon a gift. We have tried in the past and were successful once, but after that they got really strict. Also, YG Entertainment does not accept any gifts at their agency unless the actual artist or management knows about the gift. We have sent gifts to many celebrities in Korea, but we have no idea how to send gifts to G-Dragon. There are no businesses in his name that have been made public. However, we have sent many gifts to Lee Seung-hyun (Seungri) by delivering them to his families’ businesses and his businesses. But it is best to ask other G-Dragon fans for advice and see what they say. Hello, I recently sent Kim Taehyung (BTS) a birthday gift but I checked the tracking and it said it was rejected (only once though)?! I’m extremely disappointed because I spent over $170 on this present plus international shipping and it would be a waste if he didn’t receive it. I feel horrible now because I may be getting my gift back. Did Big Hit change their gift policy? Sadly, I don’t know any of the members perosnally but I really don’t want to receive the gift back. I spent way too much time making it and putting it together, stabbing my hands with needles, getting glue stuck to my fingers, staying up late nights. What can I do about this? Is there anyone, that you know of, that I can contact about this situation? I forgot to add if I need to use your service to get the gift approved. I prefer handmade gifts but if they reject it, possibly, i would like to use a trusted service to send a gift. Hello, I am sorry to hear about your gift not being accepted. I believe Big Hit Entertainment changed their policy. We went to make a delivery a few weeks ago and our delivery was rejected, which was too bad for the fan that placed the order. Sometimes agency change their policies. BTS is a very popular group, probably the most popular right now and their company knows this. When we went to make the delivery, the security guard told us that they send back all packages / gifts that aren’t expected to be received. The only way you can get them to accept it is if someone who works at Big Hit Entertainment says that they will accept it, or if the actual artist picks it up. The only thing I can think of is if you can find out if Kim Taehyung owns a coffee shop or a business, or his family owns a business and find the address to it and send his gift there. We have made a lot of deliveries to artists from SM Entertainment, YG Entertainment and JYP Entertainment by sending gifts to their businesses. Hello, unfortunately, Big Hit Entertainment does not accept fans, unless you get confirmation from the agency or someone who works there. I think your best chance is to contact people from fan groups in Korea who may be connected to BTS or some really big or official BTS fan clubs. They used to accept gifts from whoever, but just recently stopped accepting gifts at their agency. If Taehyung owns a coffee shop or a restaurant, or a family member of his, like his parents own a restaurant, you can try sending it there as many fans have done that for other artists in Korea. Hi can i send a plant to A.C.E from Beat Interactive Ent? Hello, you can order something from our website and we can deliver it to Beat Interactive Ent. We have made a delivery to KANG YOOCHAN recently. The address to Beat Interactive is 21 Seongmisan-ro 1-gil, Mapo-gu, Seoul. Hi, I’m interested in placing an order soon for A.C.E but I would also like to send a package of my own. Is that the complete address I would need? And how would I address the package? To both A.C.E and Beat or just A.C.E? Hello, I am unsure of the address of the agency, but you may be able to find the address at http://www.kpopvisit.com for the agency. You should address the package to A.C.E and write the address for the agency. Or you can just write A.C.E – Beat as the receiver and it should be clear. Can i only deliver to one person? If i want to deliver to A.c.e members how should i put it in First name and last name of recipient? You can just write the certain names of the members. Then they will have to share the gift, but usually people send something to one specific member. But you can just send something for the group and then maybe the members will decide who will keep it. what do i key in in the recipient korean phone box if i want to send smth to an artiste? You can just write “000” as we can access the phone numbers of the agencies. And for postal code just write “000” and address as “Seoul”. Basically, just fill in as much information as you know, and you can leave the rest as “N/A” since we know most info about agencies. But you cannot leave it blank, because something must be written in the blank. Hi! Your blog is very useful. We are preparing a birthday project for Gong Yoo his agency is Soop Management. Is there a way we can send the flowers to his agency? Have you ever been rejected by this agency? We haven’t been rejected by SOOP Entertainment yet. We delivered some gifts just last month for actess Nam Ji Hyun at SOOP Entertainment. So I have a feeling they will accept the gifts for Gong Yoo. Unless they have recently changed something. Hi. I am a fan from Malaysia. I’m a fan of Seventeen from Pledis and this is my first time i try to send a gift for them. and i am not sure how of all of this process work? did i need to send my own gift to them or i can just order from you and how the process will be?? Hello, we have delivered many gifts to Pledis and a few for Seventeen. Most gifts to Pledis have been for NU’EST. You can order items off our website and we can deliver them to Pledis for you (Every order includes a card message for FREE). I believe it is also possible for you to send boxed items from your country to the agency, though we have no experience with that. We have helped people by receiving their gift first and then combine it with some items they purchase from us. And then we make the delivery of all of the items together to the agency. However, for that service, a minimum of $100 US must be purchased from our shop. Hi. I would really hope to send a letter and gifts for Kang Daniel but I dont know what way should I use. Can you please help me? So Kang Daniel was a trainee with MMO Entertainment, which is owned by CJ Entertainment. I don’t think MMO has their own address, but he is currently with Wanna One, which is with YMC Entertainment. We have delivered to YMC Entertainment for other Wanna One members like Aron, Ong Seongwoo, and a few others at YMC Entertainment, but I am unsure how much longer the Wanna One group is going to be under YMC Entertainment. We can deliver to an address you give us, but it is probably better to ask other fans about how to deliver and to where, as they will have more recent information. Hi! Just saw this post. MIXNINE ended recently. I rooted for KIM HYUN SOO from HAPPY FACE ENTERTAINMENT. Unfortunately, he didnt debut. Is there a way I can send him gifts? Hi, I don’t know specifically for him, but I know that Happy Face Entertainment accepts gifts for their artists/employees at their agency. We have made many deliveries to members of Dalshabet and people at the agency always accepted the gifts. Some members of Dalshabet even posted pics of some of the gifts fans chose from our online shop on their Instagram/twitter. If he is still with Happy Face Entertainment, then I believe it should be okay to send him gifts by sending them to Happy Face Entertainment. Hello and thank you for the very well explained blog. It really helped understanding what to do and expect for an international fan like myself. I hope you can help me with my request. I write to you from Dubai and i am a hard Monsta x Fan . Wonho’s birthday day is on the 1st of March. It is also S.Korean independent day / public holiday there . They will have their concert in Singapore on the 3rd . But i would like to know the best way to send him a gift and possibility that he would receive it . I am pretty sure he will be in Korea end of Feb . Monsta X are from Starship Entertainment Agency . I heard many fans sending gifts and cakes to the agency and were contacted by the agency . however; i am not Korean so i am not sure how to communicate. Can you help me please ! Hello, we have sent many gifts to Starship Entertainment. The best way for him to receive your gifts, is to send them to the agency. You can just choose some items on our website and we can make the delivery for you. However, agencies will most likely be closed on March 1st, since it is a public holiday. So you can either probably have your gifts delivered on the 2nd, or on February 28th. But, items can be sent to Starship entertainment on any weekday. So, you can find out when he is in Korea and send him the gifts to his agency when he is in Korea. And it is also a good idea to put your social media account name at the bottom of your message/letter, so he knows that it was you that sent him the gifts, as there may be others with the same name as you sending Wonho gifts. Hi, first of all, thanks so much for writing this! I want to send a gift to Shin RhuJin (JYP Trainee) but I heard that JYP no longer accepts gifts for their artists anymore D: Is this true? Only letters/ message books/ food support is allowed? Are you guys still allowed to send gifts there? Hello, thank you for your comment. Honestly, we have no idea what is going on currently at JYP. But I know that they received gifts for a period of time, but I’m sure they no longer do. JYP normally does not accept gifts at their agency for any of their artists. It is best to ask other fans or maybe people in fan clubs, as they will have a better idea. Hello, we have delivered to Cube Entertainment before and we were able to deliver some flowers and chocolates to a member of BEAST. So I am sure we can deliver to the agency again for btob. Hello! I’m from Brazil and I’m thinking of sending a gift to VAV, who are under A team ent. I don’t plan to send it now, but I found this post very interesting and if it’s possible for you to deliver it to them, I’ll buy them a gift. Hello, that agency doesn’t seem like a very big agency, so I am sure they will accept the gifts. We just need to find the address of the agency. Hello,I am from Sri Lanka .I want to send a gift to BTS do you think Big Hit Entertainment will accept gifts? Hello, they will not accept gifts without giving their approval. I am not totally sure, but I heard from a fan that there is a place on their website where you need to fill out something to be able to send a gift to them. Hello I am from India. I want to send gifts to exo members and i dnt kno any agencies as well as I dnt kno how to do it will u please recommend me? I will wait for ur reply. Hello, EXO is with SM Entertainment and they do not accept gifts for any of their artists, unless there is a very special event. We have been able to deliver to some members of EXO by making a delivery to a theater where the memeber is performing as a member of a musical or theater drama. The best thing to do is to ask fellow fans if they know if a member is performing in a play or a musical, and ask them for more information. Hello, FNC Entertainment accepts deliveries at their front desk for their artists. You could probably send your own package to their address. You can find their address at http://www.kpopvisit.com Or you can just order something on our website and just fill in their address as “FNC Entertainment” as we have made many deliveries to their agency. Do Monsta X accept flowers and gifts? I’m an artist living in Israel and I’m planning of traveling to Korea next month. As a gift, I want to give one of EXO’s members a special painting made by me and deliver it to SM. The problem is that I’m pretty sure that delivering a gift to a group like EXO is not easy, especially giving the fact that some member said they won’t be receiving gifts from fans anymore (I’m pretty sure they meant that they want their fans to stop spending money on them, so that’s why I want to still try giving out the painting). Do you have any advice you can give me; Do you think it’s even possible to make sure he gets it, or that SM headquarters won’t even accept it at their front desk? Hi, i just want to know if it’s possible to send a gift for IU? Honestly, we have never tried as we haven’t received an order for her. But her agency may accept it or maybe she owns a business. Your best bet would be to ask other fans and find out if there is a way to send gifts to IU. How much does shipping cost and how long does it take to arrive from Malaysia to Korea? If I send my postage to JYP company how will they pass it to the artist? Is there some times where they receive package but they just ignore it or keep it away from the artists? Hello, unfortunately, we have no experience shipping something from Malaysia to South Korea. You will have to check with your post office or a UPS company in your country for the cost. And from what we know, JYP company does not pass on the item to their artist unless the artist knows that something is coming. There are only certain days artists receive items, but every artist is different. It’s probably best to ask other fans of the specific artist if there are any specific days where they will accept gifts. Hi ! Im from Malaysia . I want to give some presents to the boyz (cre.ker entertainment ) do you think they will accept the gift ? Can you delivered to them ?I love them a lot . Hello, they are in the same building with Starship Entertainment and Plan A Entertainment, and we have made deliveries to both of these agencies. So we can deliver gift items we have available on our website to them. hi ! I’m from Tunisia .. do you know how can i send a gift to pentagon from A CUBE ? cuz I don’t know if they accept gifts from fans or no ..
Hello, we have delivered to Cube Entertainment for many of their artists. They accept gifts from our delivery men, but I am unsure if they accept gifts at their agency from fans. Maybe you can ask other fans about that, but if you order something from our online shop, we can deliver it to the agency for a staff member to receive. I’m from the US and I would like to know if it was possible to send a gift to a broadcasting agency. I was planning on sending each member from knowing bros a gift but seeing as SM doesn’t accept gifts and two of the cast members are from SM I figured sending it to Jtbc would be the next best option. I remember seeing how a fan sent a letter to them but i don’t know if gifts are accepted. The gift(s) isn’t for a specific member it’s for all of them to enjoy. Hello, I am not sure if JTBC has any policies regarding reception of gifts, so I’d recommend that you check with them first. We can of course deliver in the reception and ask them to give it to the members of the TV show which in many cases works. Hello miss ~ sory for disturb u.. i just want to ask is it available if i want to send something vis post..?? I mean from my country to korea at starship entertainment..?? It is possible to send directly to Starship entertainment which is also one of the agencies that are usually happy to receive letters and gifts from their fans. Hello, do you think it is possible to send a gift to Around Us Entertainment? Highlight’s agency? I already sent them an email but they haven’t replied. Please let me know. Thank you! We have delivered several times to Around us and haven’t had any problems so far. So I’d not be concerned about sending gifts to them. If you can get a confirmation from them it’s obviously even better but it shouldn’t be necessary. Can I send gifts and fanmail to Kim Samuel?? If yes, please tell me how. If no, that’s fine with me. I need to know straight away please?! We have successfully sent gifts to Brave entertainment for Kim Samuel so I’d assume it is still possible to do. If you place an order on our webpage, we will deliver it to the agency who will pass it on to Kim Samuel if he is not in the office himself. If you have a special fanletter that needs a nicer print, we also provide printing service on photopaper for 3$. You can find it on our webpage. Regular black/white print on standard A4 papers are free and we also provide small cards with your own message for free. Hello do you do cake delivery too? Yes we do cake delivery too. You can see the cakes we can deliver in our webshop. I’m afraid that both SM and JYP are agencies that refuse to receive any gifts from fans. There are special occasions, where they might open up to gifts which will usually be announced on their webpage and on various fan pages. We would love you to come by our shop of course, but it’s almost certain that if we try to deliver to JYP or SM, they will reject our delivery in the door. Hi. Do you perhaps know the fan mail address of iKON? If there is address for the official fanclub – fan mail address, please tell me too. Do they accept gifts? If so, please let me know. Hope to hear from you soon. Thank you. I’m afraid that I am not familiar with the official fan clubs contact information. There might be a local division of their fan club in your country, you could check. iKon is still managed by YG as far as I know, which typically refuses fan gifts unless agreed upon in advance. You could try to ask YG how to send gifts, or if they can share the contact info of the official fan club. I’m sorry that I can’t help more…YG is managing some of the biggest celebrities in Korea, and of practical reasons I guess, have to refuse gifts per default. If you get more information, we would love to help you of course. Hello, do you know if Park Yoochun receives gifts? He will have a mini concert at the COEX auditorium in a few days. Thank you. I am not aware of whether gifts will be accepted or not. But it’s quite common that they allow gifts at the entrance. hello, do you know if Park Bo Young is accepting any gifts? hello, do you know if Park Bo Young is accepting any gifts? cause i saw her vlive she’s accepting any letters from a fan but im not sure whats her address or agency. Hello, we haven’t actually delivered to Park Bo Young at her agency so I honestly don’t know if they accept gifts. When I look up her agency Fides Spatium, it seems like they don’t have a webpage however, they are present on Naver (Korean Google) and I have their address in Seoul so it’s not a problem to bring a gift to their location. If you want to give it try, we are of course more than happy to help you out but we cannot give any guarantee that they will accept it. Choi Minho and SHINee works with SM Entertainment that receives gifts on his behalf. You can place an order on our webpage and simply enter the agency’s address in the recipients fields. We have recently delivered to Choi Minho so it should not be a problem. However it’s always good to contact the agency in advance. hello. do you know that if actor son chang min agency accept gifts? Blossom entertainment! I honestly don’t know if Blossom entertainment and Son Chang Min accept gifts. I don’t recall that we have delivered there before. It doesn’t appear to be a company with strict policies though, anyhow, I’d always recommend that you take direct contact to the agency and let them explain their policies if any.